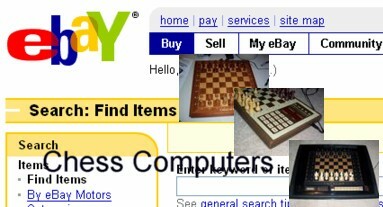 Your best option to find a Phantom Chess, Excalibur Mirage, Mephisto, Conchess or other vintage and used chess computers for sale is on eBay. Here you have a dynamic list with carefully chosen keywords to show you what's available right now. All these items are available either in the United States or other countries where the sellers will ship to: worldwide. Please note that these are NOT my auctions, so please check the seller's feedback and follow the usual steps for a safe transaction as listed on eBay. Go to the forum and ask questions if you want to verify if a high profile auction is legit. There are collectors there who are willing to help you out. You can refresh this page to update the list.